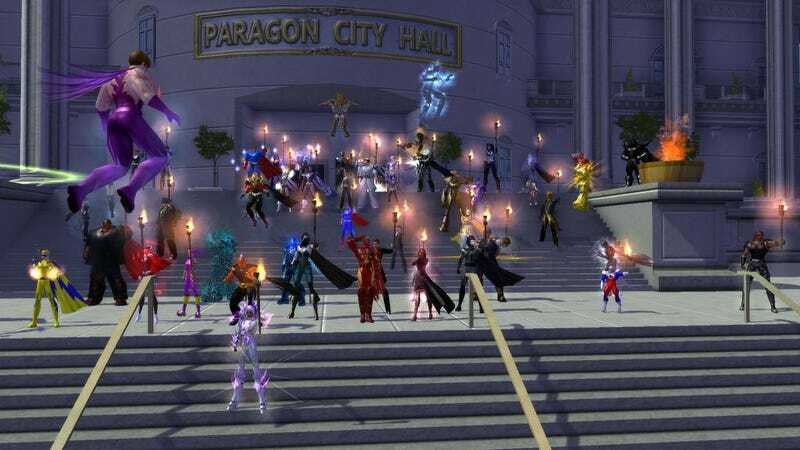 Last night NCsoft shut down City of Heroes, a landmark game that eight years ago brought the thrills of super powers and comic-book crimefighting to an MMO roleplaying world. Here are some videos users captured of the game's final moments, and some of the valedictory tweets sent as the game came to an end. The image above was sent by Richard Cobbett, a freelance writer in the U.K. Most of the action was in Atlas Park, where heroes and villains held rallies. We begin with WayTooLateTV in the lair of an archvillain: "The final few minutes of City of Heroes, following @BigAngry as he has a gift for Lord Recluse." MMO Anthropology livestreamed the final moments. Here is Amerist (character: Star Lynx) reporting live from the vigil on the Champion Server. Character creation itself supplied a lot of fun in City of Heroes YouTube user Charles McGuire mourned the game's closure with this 12-minute remembrance of all of his heroes and villains. From Darkborn, this is Atlas Park No. 7 on Freedom Server. "There I go spamming my Instant Rawr button in excitement," says Darkborn. "It was a good run. I will sorely miss it." And thanks to Kotaku reader DigitalJuno, this is City of Heroes' final task force mission, an under-manned team completing the assignment just seconds before Protector server was taken offline. The video was uploaded by Septipheran CityOfHeroes. "Nice way to take it out," says DigitalJuno.